An unmanned aerial vehicle, or “drone”, hovers above an event I covered recently. I am a naturalist. Nature, I believe, is our best friend and the most important thing in our lives. Without nature we are, literally, nothing. 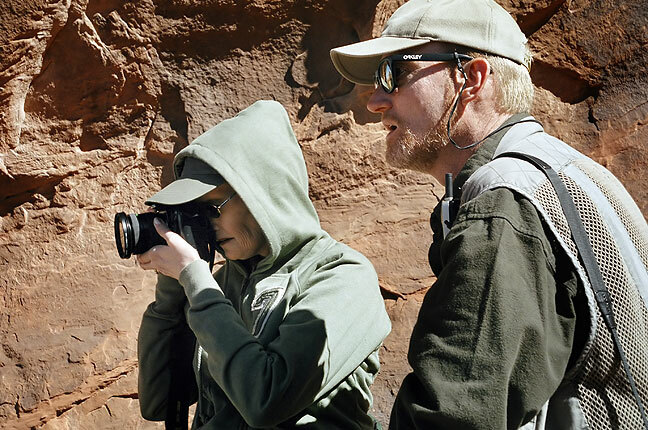 Abby and I hike and make pictures on the Primitive Loop at Arches National Park the morning after we got married there. At the core of our activities in natural places, including our wedding, is a sense of awe and respect for our natural surroundings. The first time I visited Delicate Arch, in November 2002, there were few hikers. In the years that followed, crowds have increased, and recently I find the experience less pleasant as a result. The day after Abby and I got married at the majestic Delicate Arch at Arches National Park, Utah, we hiked with some friends on a nice trail at Arches called the Primitive Loop. Although the day started cold and windy, by noon it was a magnificent October day in southern Utah. Near the end of the loop trail, Abby knelt down to photograph a small purple flower growing in the sand next to the trail. Another member of our party blundered up and pulled it out of the ground and asked, “What’s this?” After seeing the shock and anger on Abby’s face, he stuffed it back into the ground, but of course, by then it was done: you can’t “unkill” a flower. 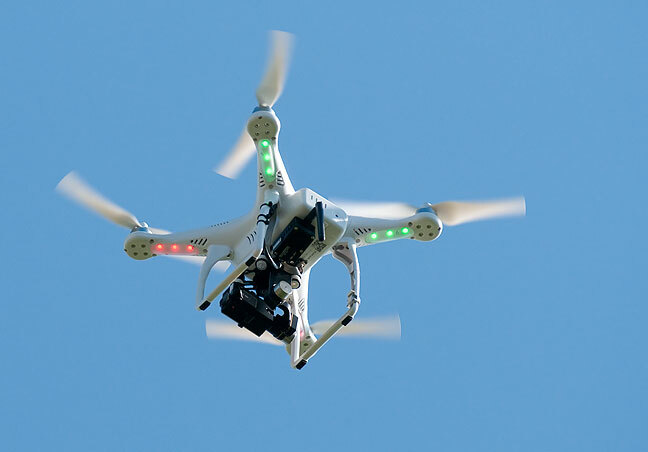 I tell you this because a friend of ours surprised and dismayed us recently by carrying his unmanned aerial vehicle, or “drone,” to Delicate Arch, and once there launched it and flew it around for a bit to make video. It can be pretty upsetting, honestly, when people are openly disrespectful of others and of nature because they think something is cool, or worse, when they don’t care if something is disruptive because they think it will make them money or fame. Add to that the fact that beautiful sites like Delicate Arch are under attack by their discovery by the public; there are far more visitors to the Arch today than even the first time I saw it in 2002. This creates “The Grand Canyon Effect,” in which the number of visitors reaches a critical mass and renders the experience cheap and touristy. In that circumstance, the last thing I want to see is your stupid buzzing drone making more noise and spoiling the view even more than it already is. Like not being able to unkill the flower, you can’t unruin someone’s natural experience. 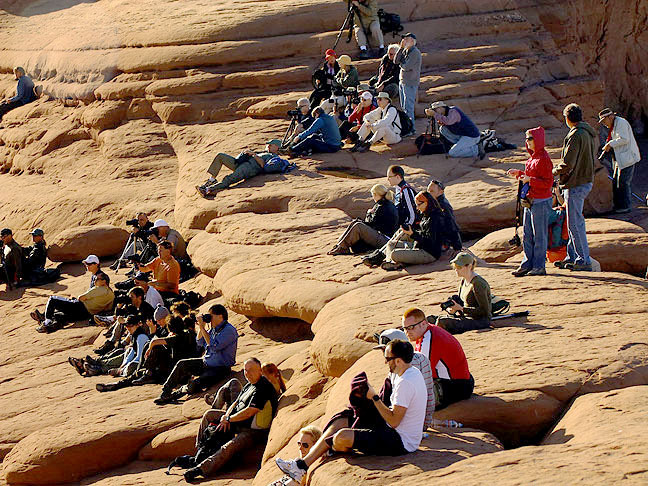 Throngs of tourists gather at Delicate Arch in October 2009. With this many people on hand to share the experience, it’s important to remember that we all share this wonderful place. When I pointed out on Facebook that flying his drone was both inappropriate and illegal, at first he seemed to apologize, but later deleted my comment. He left the video up, and kept a comment saying it was “cool even if it is illegal.” There’s the rub, really. Ultimately, most people don’t care about the experience of the National Parks or the peace and quite that helps preserve their sanctity, as long as they get some “cool” pictures or video to plaster all over social media. Abby and I love photographing our National Parks, but we never do it at the cost of nature or the experience of others. 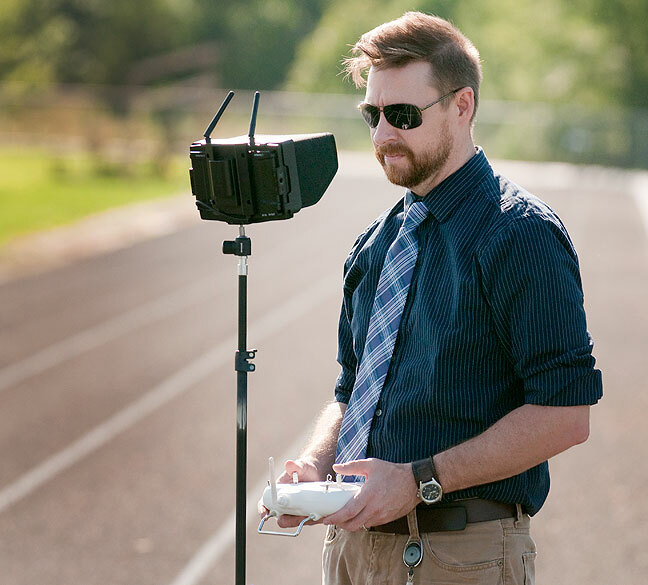 Chickasaw Nation photographer Brian Harrison pilots a drone while using a remote monitor to find the right shots for his video. Brian was flying his drone at a Chickasaw Nation event at Byng School, and the school pre-approved his use of the drone. This is quite a different situation than using such a device at, say, Mount Rushmore. Richard – I would like to share some facts about this story. Fact #1 I did not know it was illegal. I have never read the laws pertaining to national parks. In fact, I am have been to very few of them. So I am a novice. Fact #2 – I left your comment on FB and then responded to you that I did not know it was illegal. Fact #3 – Someone else on FB posted a comment acknowledging that it was illegal and commented that he still thought the video was cool. Fact #4 – Just like you deleted nasty comments about Obama from your page, I do not support negative, harsh, or violent comments on mine. Therefore, I did delete your comment. Facebook is a frivolity for me. I do not intend to engage in negative and harsh dialogue with anyone. I totally respect your passion for the preservation of the natural experience. I shared it as well. Your photography is a tribute to that passion. I can assure you I did not intend to offend anyone with my actions, least of all someone like you who I hold in high regard. I cannot undo what I did with my drone at the park. I can only change my actions moving forward. And now, thanks to you, I have awareness of the law and a better perspective on how some hold their experience as sacred. Thank you for that! >>”I cannot undo what I did with my drone at the park.”<< That was the whole point of this article. My takeaway from all this? I’m pissed at the dingdong who pulled up the flower. As of the posting of this comment, the drone video in question is still up and viewable, and the only comment accompanying it says, “I think it is cool.” This can only serve as encouragement to other National Park “novices” to fire up their drones as well. I am not condemning you as a person and I am not calling you names, but I stand by this original post: that such behavior inherently diminishes the natural experience and that keeping it posted on your web site and Facebook endorses that behavior. I had a long blog entry about “drones” ready to publish a few days ago, and then I realized I wasn’t passionate enough about it to finish, and so deleted the entire thing. What I don’t like is the fearmongering in the media about Amazon’s delivery drones, or the government spying on us with drones, etc. Sure, there will be issues. And then we’ll work them out. For personal use, I’m glad to learn that they are outright banned at national parks. I think cities and states need to get out in front of the trend with common sense legislation that allows personal use but also addresses the public’s concerns about privacy, noise, and annoyances.